1882-1884 autograph album that belonged to Rowene M. Brooks of Catskill, New York. 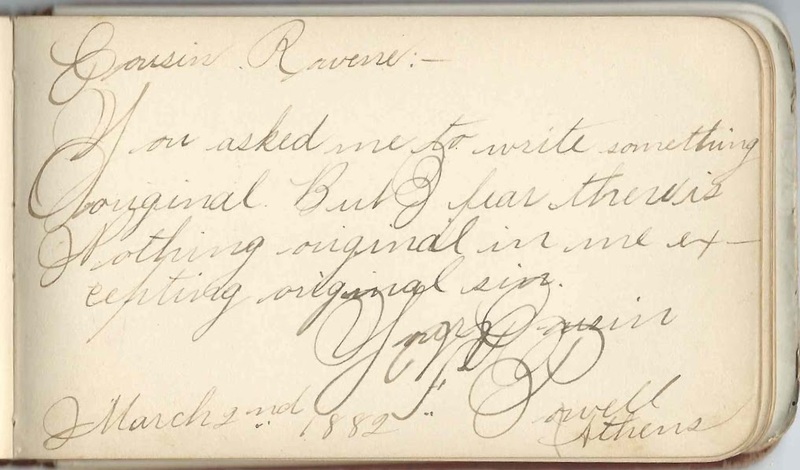 See another post that features Rowene's 1885-1936 autograph album. 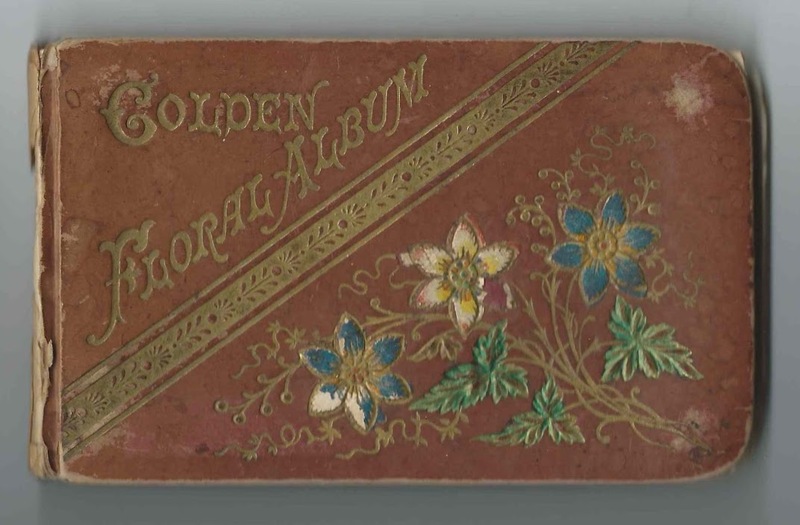 The album is approximately 5-1/4" x 3-1/4" and contains the sentiments of 28 of Rowene's relatives, friends and schoolmates. An alphabetical surname list and an alphabetical list of the senders, together with any personal information they offered, appear at the end of this post. Several illustrated pages are scattered throughout the album. Some of the people inscribed pages in both albums. Rowene Brooks was born in September 1868, the daughter of John Morrison Brooks and Mary Jane (Chase) Brooks. About 1892 Rowene married William Webber, who was born about January 1865 in New York. The other album contains pages inscribed by William Webber and two of their granddaughters, Morrell Fosdick Webber and Adrienne M. Webber in 1936, when the album apparently came to light. Rowene and William farmed at Coxsackie, New York, and had, I believe, two children, one of whom died young; the other, Robert Brooks Webber, was the father of Morrell and Adrienne. William Webber died in 1943, and Rowene (Brooks) Webber, a centenarian, in 1970. They're buried with Brooks and Webber family members at the Town of Catskill Cemetery. Two of Rowene's cousins inscribed pages in her album. One was F. Powell of Athens, presumably New York. He may have been Forrest Powell. The other cousin was Georgianna Goes, daughter of Barent Goes and Sarah Jane (Brooks) Goes, who was a sister to Rowene's father John Morrison Brooks. Georgianna inscribed her page on January 18, 1884. Georgianna Goes, signed on January 18, 1884; Rowene's cousin, who was the daughter of Barent Goes and Sarah Jane (Brooks) Goes, who was a sister to Rowene's father John Morrison Brooks. Laura Lohmann, signed at Catskill, New York, on "2-2-1883"
Annie O'Brien, signed at Catskill, New York, on "1-7-1884"